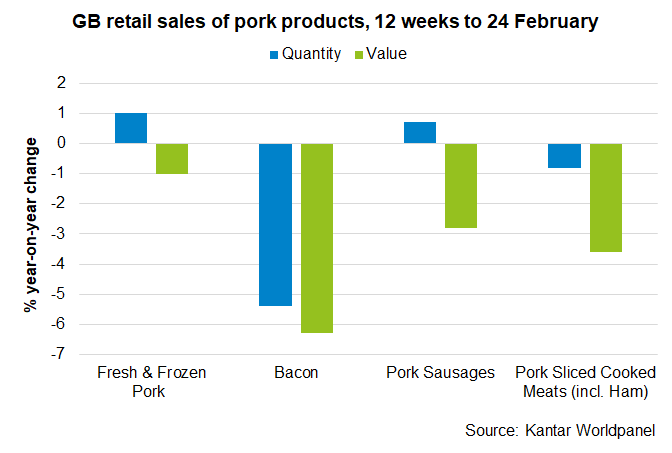 In the 12 weeks to February 24, 2019, retail sales of GB pig meat were down only slightly compared to the same period last year (-0.8%), according to Kantar Worldpanel. The value of these sales fell by 3%, reflecting lower shelf prices. 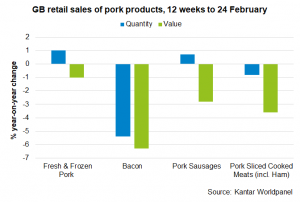 The quantity of fresh and frozen pork sold over the period actually rose by 1%, although the sales value fell by the same amount. Within this category, the volume of shoulder roasting joints sold improved the most on the year (+38%), while leg roasting joints suffered the largest drop (-15%). Quantities of chops and steaks sold remained stable on the year, however a drop in average shelf price meant the overall spend on these cuts fell by 4%. Bacon purchases fell by 5% in quantity, despite average shelf prices falling slightly. Kantar reported 3.7 million fewer shopping trips included bacon compared to the same period last year. The overall bacon spend fell by 6% as a result. Sausage and sliced sales remained virtually stable on the year (+0.7% and -0.8% respectively), but lower shelf prices meant the total spend suffered. Meanwhile, the number of pork pies and sausage rolls sold rose by 5% and 9%, respectively.